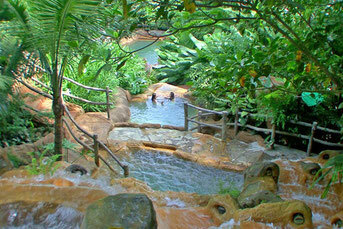 Enjoy the Hot Springs near Arenal Volcano and La Fortuna. 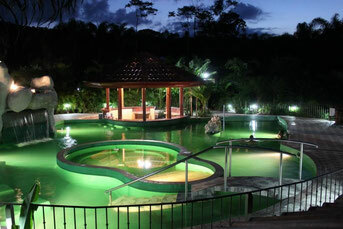 Something you definitely should not miss during your vacation in Costa Rica is a soothing soak in one of the naturally heated Arenal Hot Springs, you can choose Tabacon Hot springs, Baldi Hot Springs, Paradise hot springs , the Springs Resort and Spa or Kalambu Hot Springs Acuatic Park. 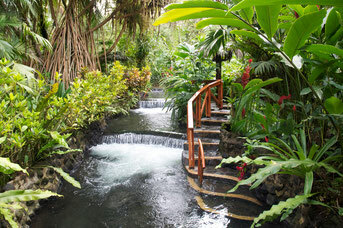 Baldi Hot Springs is located just 5 minutes driving from La Fortuna, close to the main hotels at Arenal Volcano area, the Baldi Hot Springs facilities provide 25 pools that flow naturally from the Arenal volcano, exuberant tropical gardens, and spectacular panoramic view of the Arenal Volcano. Reserve with us cheap one day pass with meal included. 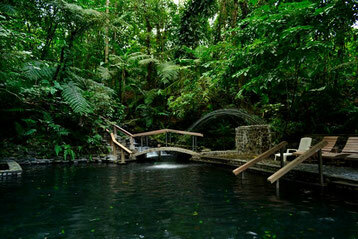 The Tabacon Hot Springs perfectly combine mineral content, volume and temperature. While there are many hot springs destinations around the world, few offer this special balance set in a splendorous natural paradise. Hot springs are considered a natural expression of Earth's inherent energy. Visit for one full day or night pass with dinner included. Two days pass and dinner included. 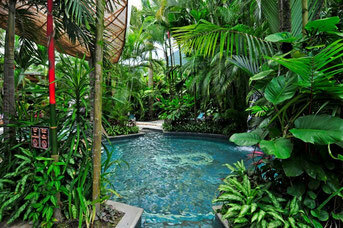 Always feel in the tropics by being surrounded by beautiful tropical gardens. Admire exotic palms, flowers and even costarrican coffee trees; and don't forget about the main character...breathtaking Arenal Volcano! Ecotermales Fortuna is located 5 minutes from La Fortuna, allow only a limited number of guests each day, and provide a private, relaxing oasis during your vacation. We recommend to reserve in advance. 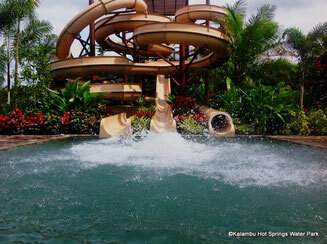 Kalambu Hot Springs Water Park is Arenal’s newest attraction! Open every day. For all the family.